RPGs, no, it’s probably not what your thinking of – rocket propelled grenades. Although those kind of RPG’s sure are cool and a very useful weapon in today’s current gaming environment. What RPG stands for in this article is, Role Playing Games. Not just any role playing games, it’s a trip down memory lane, this article looks at where RPG computer gaming began. In short, it’s a little computer gaming history lesson of some of the earliest and most notable RPG computer games created. If you grew up in the 1970’s or 1980’s like I did, then chances are you probably played board games on a table with your friends such as Dungeons and Dragons (D&D). It most likely would have been your very first role playing gaming experience, one that did not involve the use of computers, instead pen and paper, a board and dice. The history of the very first Dungeons & Dragons board game comes down to two men – Gary Gygax and Dave Arneson. As a teenager in the 1960’s, Dave Arneson was fascinated with war gaming (you know with plastic figurines, plastic military vehicles, buildings, weapons, that sort of thing), which led Dave to adding role playing into his war gaming experiences. As a University of Minnesota student, Dave Arneson met up with Gary Gygax at the Gen Con gaming convention in the late 1960’s. Soon after meeting Gary, in 1970, Dave Arneson had created his own RPG game, it was based on medieval and fantasy, he ended up calling it Blackmoor. When he showed Blackmoor to Gary Gygax the following year, the pair co-developed a new set of rules that became known as Dungeons & Dragons (D&D). During this development phase, Dave Arneson personalized the massive battles of their fantasy war games with the exploits of individual heroes. This inspiration led to the first fantasy role playing game in which players are characters in an ongoing fantasy story. Storytelling became the core of D&D. You and your friends tell a story together, guiding your heroes through quests for treasure, battles with deadly foes, daring rescues and much more. The next step in this RPG evolution was computers. As companies like Apple, Tandy, Atari, Commodore and IBM began sprouting and selling there hardware, computers began to enter the retail and society mainstream, RPG’s natural selection went from people playing D&D style board games on tables to playing newly created RPG styled games on desktop micro computers. Origins of the very first graphical adventures that were ported from pen and paper board games on to home computers started to appear around the late 1970’s and early 1980’s. What i found interesting about researching early graphical computer games is that many well known titles, regarded as RPG legends of that computing era and recognised as the graphical computer games that started it all, were more often than not homebrew creations, these homebrew developments would also be the catalyst for forming software companies. Around Thanksgiving of 1978 Jim Conelley had teamed up with John Freeman to form the company called Automated Simulations (which later they renamed the company to Epyx), however it was earlier in 1977 that Susan Lee-Merrow had invited Jon Freeman to join a Dungeons & Dragons game hosted by Jim Connelley and Jeff Johnson. Here is where the homebrew magic of the first ever RPG computer game had become a reality but they just didn’t know it quite then. It wasn’t a glamorous beginning, Jim Connelley bought a Commodore PET computer for bookkeeping to help him with being a D&D dungeon master. The purchase of the Commodore PET led to Jim Connelly and John Freeman developing space war themed games but it wasn’t until 1979, when they would release a dungeon crawl RPG video game on the Tandy TRS 80 and Commodore PET, called The Temple of Apshai. In gaming circles this game is thought to be one of the very first graphical home computer RPG games. The role-playing system, named ‘Dunjonquest’ was designed by Jon Freeman and the level design of the dungeons was provided by Jeff Johnson. All the ingredients of the pen and paper RPG board games were there but, Temple of Apshai had two other key ingredients: The first computer role-playing game with room descriptions and the second was that it had on screen graphics. In the normal D&D board games verbal depictions were given by a Dungeon Master to detail settings of the game, Temple of Apshai on computer made the Dungeon Master redundant. You could now see for yourself in all 8-bit glory detailed descriptions about each of the rooms in the game’s manual, you could also match an on-screen room number to its entry in the manual that accompanies the game. Other differences from the board game archetype include the player character when beaten by a monster may be rescued by one of several non-player characters. Depending on the rescuer, a portion of the player’s inventory is taken away as payment. The game has no particular goal other than fighting monsters, collecting treasure and gaining experience points. For its time the reception was massive, it held a very long stint in the top games charts from 1979 – 1984 and was still recognized in 1987 as the third best selling game on the Commodore by Epyx. Temple of Apshai was awarded the Origins Award for “Best Computer Game of 1980”, the first computer game to receive this distinction. Temple of Apshai was the first game in a series which spanned ten individual titles, including expansions, smaller games, prequels and a full sequel called Hellfire Warrior. The games appeared on numerous computer systems. Tandy TRS-80, Commodore PET, Apple II, Atari 8-bit computers, IBM PC compatibles, Commodore VIC-20, Commodore 64, Apple Macintosh, Atari ST, Commodore Amiga and later in 1987 the trilogy was adapted to the Amstrad CPC by d3M Software and published in France with the title La Trilogie Du Temple D’Apshai. 1979 appeared to usher in computer based fantasy type D&D RPG games, it was like a euphoric wave of releases and the United States was where the action was happening. Along comes a teenager from Houston, Texas, Richard Garriott. While studying his junior year he takes up a school project using his school’s mainframe and an Apple II computer. He calls his work in progress video game “D&D”. He continually shows the game to his friends asking for feedback and gives it to them play testing, he never really thought the game would be seen by the public. After 28 revisions of his game D&D, it has a limited release in 1979 with the name Akalabeth: World of Doom. A new decade begins, in 1980, California Pacific Computer Company received a copy of Akalabeth: World of Doom. They contacted Richard Garriott to publish the game, the game that was designed just as a hobby ends up becoming recognized as one of the earliest known RPG examples and a predecessor to the Ultima series collection of RPG games. The California Pacific Computer company suggested that for marketing purposes “Lord British” be credited as the author, they engaged with enthusiasts of the RPG computer genre by organizing a contest for Softalk magazine readers to figure out the true identity of Lord British. Akalabeth: World of Doom, was derived as well as inspired by Richard Garriott’s love of playing pen and paper D&D and reading the works of J. R. R. Tolkien, the name Akalabeth, derives from Tolkien’s Akallabêth, part of The Silmarillion; though the game is not based on Tolkien’s story. While not explicitly stated, Akalabeth: World of Doom, is seen as the first game of the Ultima series, a very popular and influential series of role-playing video games. It was, therefore, included as part of the 1998 Ultima Collection where it officially picked up the nickname Ultima 0. The version in the Collection added CGA colors and MIDI. It ran on DOS, making it the first official port of the game to any system other than the Apple II, though an unofficial, fan-made PC version had circulated on the Internet since late 1995. 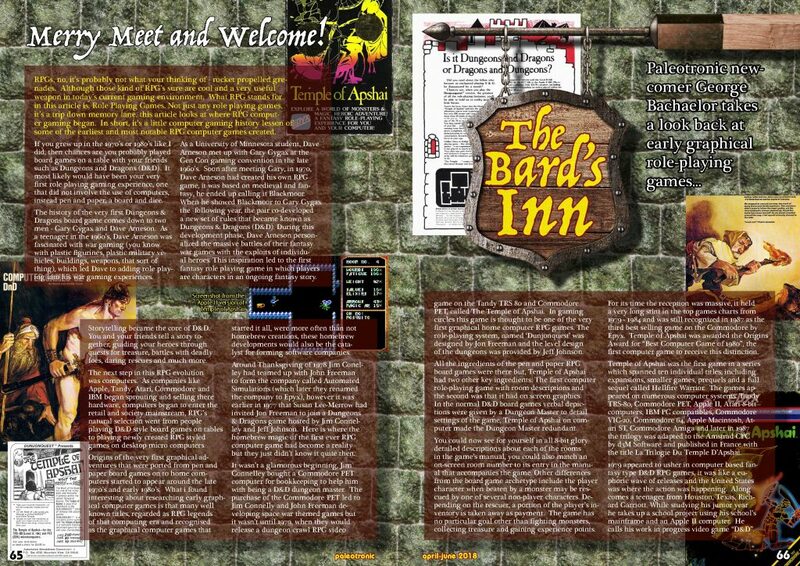 How Akalabeth differs from The Temple of Apshai is that the player receives quests from Lord British (Garriott’s alter-ego and nickname since high school), to kill a succession of ten increasingly difficult monsters. The majority of gameplay takes place in an underground dungeon, but there is also a simple above-ground world map and text descriptions to fill out the rest of the adventure. The player could visit the adventure shop to purchase food, weapons, a shield and a magic amulet; the player’s statistics can also be viewed in the shop. • First-person gameplay in dungeons. • Requiring food to survive. • A top-down overhead world view. • Hotkeys used for commands. • The use of Elizabethan English. During Garriott’s 28 earlier versions of his D&D work in progress he had used an overhead view with ASCII characters to represent items and monsters. However, after playing Escape, an early maze game for the Apple II, he decided to switch to a wire-frame, first-person view for the underground dungeon portions of the game, making it the first computer role-playing game with such graphics. The game asks the player to provide a “lucky number”, which it uses as a random seed to generate the rest of the game, including dungeons and player stats; by using the same number the player can always return to a given world. The Ultima Collection version added save game support while still using a similar random seed. While crude by modern standards, in 1980 Akalabeth: World of Doom graphics and dungeon crawl gameplay mechanics were considered quite advanced, the game attracted a large amount of attention. As Akalabeth had been written in Applesoft BASIC, an interpreted language, it was a simple matter for users to modify the source code to suit their needs or desires. For example, the game’s magic amulet which occasionally did unpredictable things, like turn a player into a high-powered Lizard Man, or a weak Toad, could be set for “Lizard Man” with every use, progressively increasing the player’s strength to the point of virtual indestructibility. One could also set the player’s statistics (normally randomly generated and fairly weak to start) to any level they desired. 1980, enter Roberta Williams. RPG computer games were no longer about fantastical medieval adventures. Roberta Williams designed, wrote and illustrated a role playing graphic horror adventure computer game called Mystery House. Roberta knew very little in the way of computer programming, so to get the game onto the Apple II she managed to convince her husband to code the game and the rest they say is history. The story is that Ken Williams (Roberts’a husband) borrowed his brother’s Apple II computer to programme Mystery House. Roberta suggested that adding graphical scenes to the otherwise text-based game would make it more interesting, they bought a VersaWriter machine, which allowed them to trace over a line drawing and convert it to a digital drawing. Roberta drew 70 scenes for the game. However, Ken found that the resulting digital drawings were too large to fit into a 5¼-inch floppy disk, instead he stored the images into the game as instructions for the program to re-draw the lines of the scenes rather than be static images, as well as writing a better version of the VersaWriter scanning software. The resulting game was a text-based adventure with a depiction of the character’s location displayed above the text. The homebrew RPG game Mystery House would, in 1980 lead to the creation of the company called On-Line Systems, which would evolve into Sierra On-Line. Mystery House is known as one of the earliest horror video games. The game starts near an abandoned Victorian mansion. The player is soon locked inside the house with no other option than to explore. The mansion contains many interesting rooms and seven other people: Tom, a plumber; Sam, a mechanic; Sally, a seamstress; Dr. Green, a surgeon; Joe, a gravedigger; Bill, a butcher; and Daisy, a cook. Initially, the player has to search the house in order to find a hidden cache of jewels. However, terrible events start happening and dead bodies (of the other people) begin appearing. It becomes obvious that there is a murderer on the loose in the house, and the player must discover who it is or become the next victim. Roberta Williams has been quoted as saying the inspiration for this type of RPG computer game came from the Agatha Christie’s novel, ‘And Then There Were None’. Mystery House had great success at the time of its release in the early 1980’s, this success received critical recognition. 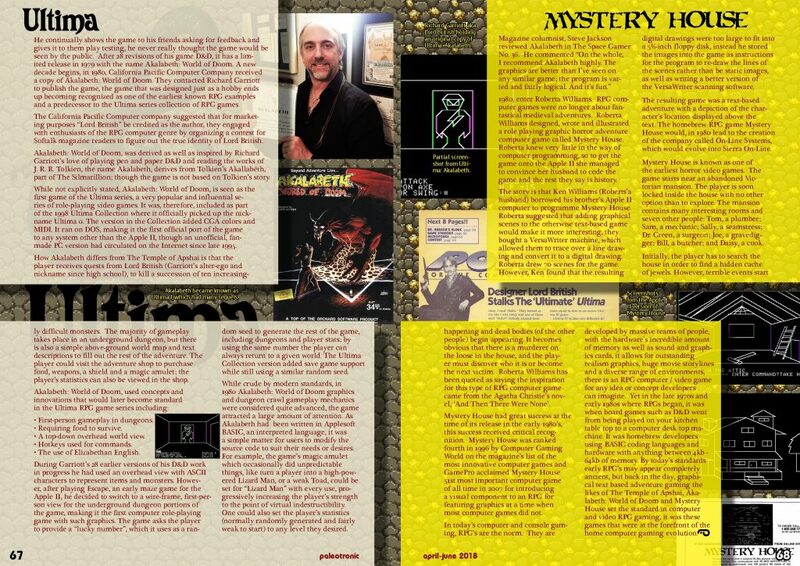 Mystery House was ranked fourth in 1996 by Computer Gaming World on the magazine’s list of the most innovative computer games and GamePro acclaimed Mystery House 51st most important computer game of all time in 2007 for introducing a visual component to an RPG for featuring graphics at a time when most computer games did not. In today’s computer and console gaming, RPG’s are the norm. They are developed by massive teams of people, with the hardware’s incredible amount of memory as well as sound and graphics cards, it allows for outstanding realism graphics, huge movie storylines and a diverse range of environments, there is an RPG computer / video game for any idea or concept developers can imagine. Yet in the late 1970s and early 1980s where RPGs began, it was when board games such as D&D went from being played on your kitchen table top to a computer desk top machine. It was homebrew developers using BASIC coding languages and hardware with anything between 4kb – 64kb of memory. By today’s standards early RPG’s may appear completely ancient, but back in the day, graphical text based adventure gaming the likes of The Temple of Apshai, Akalabeth: World of Doom and Mystery House set the standard in computer and video RPG gaming, it was these games that were at the forefront of the home computer gaming evolution.